According to the CDC, the most common types of injuries involving children in the U.S. are burns, drowning, falls, poisonings, and traffic accidents. And while some of these may not be relevant to your organization’s next event, there’s a good chance at least a couple will be. When it comes to sports injuries, a good deal of pain and misery can be avoided by emphasizing prevention rather than simply reacting after the fact. For coaches and parents, that means making sure children are adhering to these prevention tips. Don’t play through pain. Professional athletes are expected to push through discomfort; children are not. If something doesn’t feel right, make sure the kids know that this could lead to a more serious situation. Get a physical. There is less chance of injury if your child is already fit. This includes problems or conditions that aren’t easily seen or felt, like an irregular heartbeat, that could be potentially harmful. Variety is key. Playing the same sport too often can result in the same muscles being used in the same ways. This puts too much stress on muscles and joints, which can lead to an injury caused by overuse. Warm up first. Loose muscles are less likely to suffer an injury. Same goes for tendons, joints, and ligaments. Focus on a mix of stretching exercises and calisthenics. This is especially important if playing in cold weather. Get proper rest. Your child’s body needs time to recuperate between practice or sporting events. A body that is fatigued is a body that is more prone to injury. Rest also includes getting proper sleep; don’t discount the beneficial effects of this undervalued nutrient. Food matters. You are what you eat, and this is especially true for a growing child. Proper nutrients contribute to stronger bones, muscles, ligaments, and tendons. Focus on providing a balanced, whole-food diet. Stay hydrated. We hear a lot about football players who suffer heat stroke as a result of being dehydrated. This is a real concern, but not the only concern. Muscles that aren’t hydrated are muscles that are more prone to injury. Provide the proper equipment. Protective gear, like helmets and pads, is meant to protect from bodily harm and injury. But equipment only works if children are wearing it and wearing it correctly. Also make sure that equipment is in tip-top shape. Emphasize proper technique. There is a right way and a wrong way, from tackling an opposing player in football, to a pitcher throwing a fastball. Teaching kids the right ways to perform in their sport will help eliminate injuries. Treat injuries immediately. Injuries like concussions that are left untreated could worsen. While getting help immediately will make sure that the damage doesn’t progress. Let your kids know that if they feel pain or discomfort, they should tell a parent or coach ASAP. Even when parents and coaches do everything possible to limit the possibility of injuries, they still have a way of occuring, even in sports we don’t often associate with injuries, like diving at the community pool. Sporting events and injuries will always be linked. But there are things you can do to ensure preparedness at your next event. A way for staff to communicate: walkie-talkies, cell phones, etc. Training the staff on what to do should an injury occur is also key. Everyone needs to be prepared, on the same page, and understand their individual responsibilities. There’s simply no excuse for being suddenly surprised by an injury or medical emergency. At the very least, the hosting organization should also have general liability and property insurance in the event that someone is hurt on your watch. Even if you were not at fault, arming yourself with the right kind of event insurance will make sure everyone is taken care of in the end, no matter what happened. The good news is that, unlike the cities of newly crowned Superbowl champions, children’s sporting events rarely end with the winning side erupting into violence. But that doesn’t mean you shouldn’t be prepared for it, no matter how small the odds. Understanding the assumption of risk is important for anyone participating in sporting events. Much of this is based on common sense, as in what is considered foreseeable or reasonable. If a football player suffers a concussion during normal play, even if it results in a traumatic brain injury, this would still be considered a reasonable or foreseeable outcome. 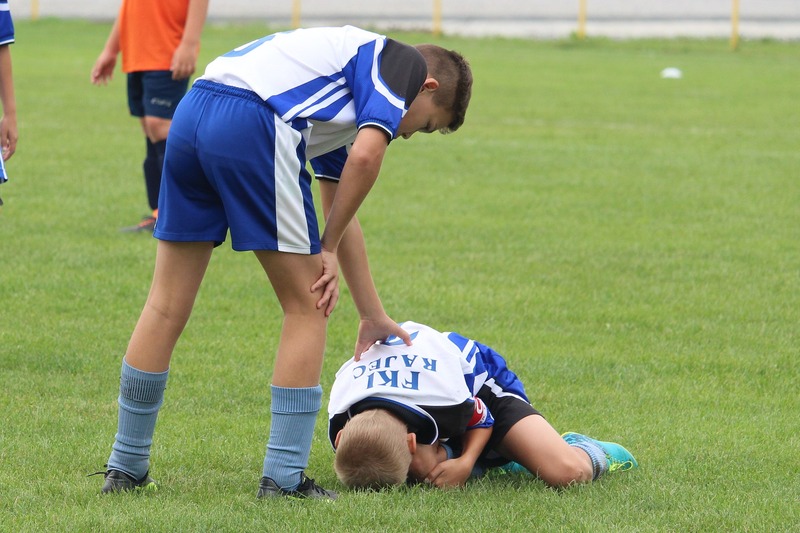 According to Dolman Law Group, where things begin to get murky is, “a sports-related injury that was unexpected or even intentional.” Using the concussion example, you assume that risk so long as it occurred as a result of playing football. You do not, however, assume that risk should the injury be caused by a fan running onto the field. Establishing liability is often a matter of foreseeable risks versus hidden dangers. Everyone understands that concussions are an inherent risk associated with playing football. But if a scoreboard falls on you while you’re playing football, this would be considered a hidden danger, and liability would then shift from player to host. There will always be expected risks in sports and occasionally unexpected risks. The issue of liability, should injuries occur, will always reside in the details. And in most cases, common sense usually prevails. Protect the ones you love at your next sporting event with this event planning guide from the CDC. When community events are properly planned and executed, we all win. And more importantly, we all stay safe.